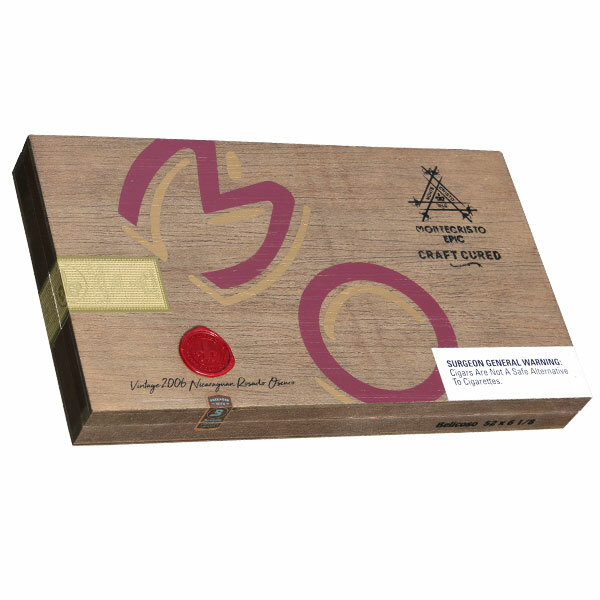 Buy Montecristo Epic Craft Cured Cigars Online! When you're the most recognized and best-selling name in the world of premium cigars, you've earned the right to be dubbed "Epic." This was precisely the case when Altadis USA (parent company of Montecristo) introduced the Montecristo Epic in 2011. The cigars were a resounding success, and the limited edition Montecristo Epic No. 2 followed shortly thereafter. After years of dormancy, the Epic name has finally returned, this time teaming with the famed Plasencia family of Nicaragua to introduce Montecristo Epic Craft Cured. Traditionally, Montecristo cigars have been crafted in the Dominican Republic (and Cuba, of course), but the Montecristo Epic Craft Cured switches gears and fully embraces Nicaragua with a vintage puro blend. As stated in the cigar's title, the blend is set apart by a unique curing/fermentation process. Tobaccos are traditionally fermented in large piles called "pilones," but Montecristo Epic Craft Cured uses much smaller stacks, resulting in a better marrying of the cigar's overall blend. Speaking of which, the company has spared no expense, utilizing a very special Nicaraguan Rosado Oscuro wrapper from a 2006 vintage. This is paired with a Nicaraguan binder (grown on the island of Ometepe) and filler tobaccos of Nicaragua's three major regions (Estelí, Jalapa, and Condega). As expected, the resulting profile is exquisite, befitting of the flavor-seeking connoisseur. Expect a medium-plus body and satisfying flavors of toasted nuts, mineral, white pepper, charred wood, tangy bread dough, and cinnamon—a complex experience to say the least.